although you may want to see the movie before reading my review! La La Land is a 2016 movie in the musical genre, starring Emma Stone and Ryan Gosling and set in Hollywood. 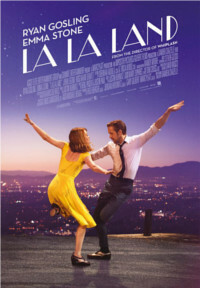 The title refers both to the nickname for Hollywood, and to a person who has unrealistic expectations: "living in La La Land". The story begins with Mia Dolan (Emma Stone), an aspiring actress who works as barista in the Warner studios coffee shop. She regularly sees famous actors and is exposed to life on set, but despite being a competent actress, all of her own auditions are disastrous. One day she runs into Sebastian (Ryan Gosling), a musician passionate about jazz, but unable to find a satisfying job in a world where jazz music is no longer fashionable. This first third of the movie is the typical "girl meets boy and they hate each other at first but reluctantly realise that they love each other" story. To accompany this, the style of presentation is very stylised -- everything is bright and colourful, there are regular dance sequences, and the characters only wear primary-coloured outfits; the colour seemed to differ dependent on their mood. However, thankfully the movie is much deeper than that. Mia and Sebastian move in together, while both working towards their dreams. Both are on the brink of success, but both need to travel to different parts of the world, and it seems their relationship may not survive. This portion of the movie is portrayed in a much more realistic way, with soulful jazz music, a darker mood, and the struggles of real life intervening. I noticed that the characters wear non-primary colours like purple, and different coloured separates, which I think is supposed to represent the complexity of their feelings. I found the ending unsatisfying and difficult to accept at first. After some thought though, I came to see it as bittersweet. It was realistic and I cannot fault that it was mature. In a way, it almost contrasted with way the story was told as a stylised fantasy. Normally I don't like musicals very much, but I do like jazz music, so I found it enjoyable to watch. Neither of the actors had particularly strong voices, and I think they were chosen for their star cachet rather than their musical talent. Although I did read that Ryan Gosling learned to play the piano for the role, which is quite impressive. I also liked that the "famous actors" who Mia and Sebastian see on their walks around the studio are played by no-one recognisable, allowing the viewer to concentrate on the two main characters. Overall, what began as yet another cheesy romance movie revealed itself to be something deeper and more meaningful. It reflected the messiness of real life: the need to compromise in order to achieve your dreams. For this, I liked it much more than I thought I would. Would I watch it again? Yes! I liked it but I think it isn't so great as everyone seems to think.